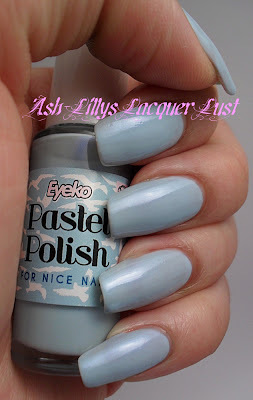 Ash-Lilly's Lacquer Lust: Eyeko and holo strip mani? FAIL! Eyeko and holo strip mani? FAIL! Oh dear. I have a bad manicure for you today friends. I'm actually half embarrassed to even show you. But then, this blog is not about perfection so I intend to document the good, the bad and the down right ugly. I have to be honest right? I don't always get it right. I was in Hobbycraft the other day and I came across a few scrap book accessories that were on sale, such as outline stickers. They were only 79p so I picked up a couple of packets along with some adhesive ribbon. The outline stickers I used were blue with holographic backing and were like a thicker version of striping tape. I thought it might work with a manicure...but then I quickly realised why I used to hate working with tape. 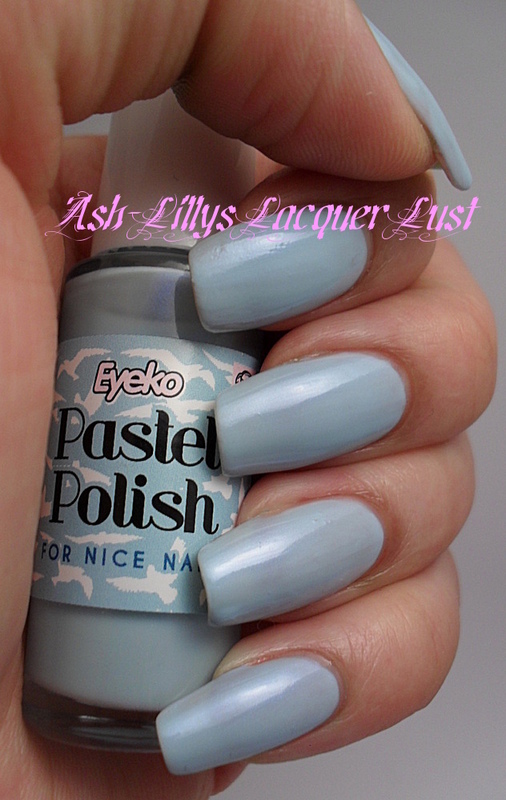 I used Eyeko's Pastel Polish which is a lovely baby blue with slightly darker blue sheen or shimmer to it, some white nail art polish and some Sally Hansen Protein base and topcoat. Urgh. Here are the offending stickers. They are pretty in their own right though. 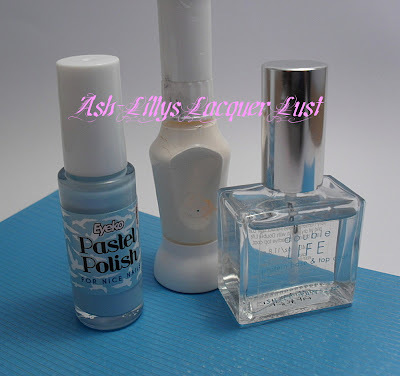 Here's the polish with a little direct light. Can you see that subtle shimmer? I made some stripes with the white polish. Put some of the tape on next to the stripes. I didn't put any special glue or bonding element on the ends of the stickers because I didn't intend to have the mani on for long. It lasted an hour. Even when I used to use striping tape with glue or a bonding element, it still lifted at the edges and I'd end up peeling it all off. Those lifting edges would give me the heebie-jeebies for some reason. If you squint at the pictures the manicure doesn't look toooo bad. Does it? Erm...I'm lying to myself aren't I? On a side note, remember I broke my index nail after Christmas? Well, the strip that I used on it is still holding up! Blue and white + stripes! It's like you're cheering for some football team. :D I like it. I really like this-- aside from the thumb and ring. The stripes on those fingers are just too close and you cant see the stripe between it kinds looks off.. The others look great!